Resonator guitar | Gear Acquisition Syndrome!! 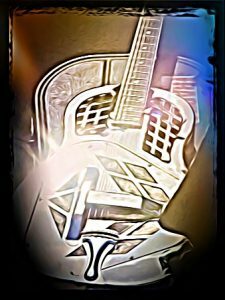 What Is A Resonator Guitar? – Steel Spider Bite And Delta Dust, Y’all! 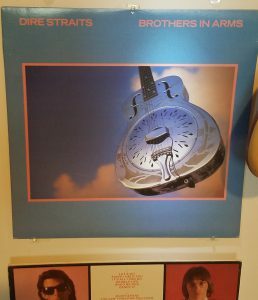 In 1985, Dire Straits came out with a killer album, “Brothers In Arms”. It’s hanging on the wall in my studio, an example of one of the best albums I’ve ever heard. I picked it up immediately as soon as I heard the first single, “Money For Nothing”. What a GREAT guitar tone!! The cover of that album featured something I’d never heard of: a Resonator, or Dobro guitar. It looked pretty cool, especially against that awesome sky background. Fast forward six years later – it was 1991, and I had just picked up the newest recording from my favorite songwriter (then as now) – Bruce Cockburn. In those days, everything was on CD, and all the car audio systems had a player. After anxiously stripping off the plastic wrap (and swearing at the security tape that wouldn’t come off! ), I finally got the album open, and slipped the CD into the dashboard deck. Four songs in, “Soul of a Man” began to play, and I heard for the first time the biting grit that a resonator guitar can bring to a recording. The song is an old tune that Blind Willie McTell recorded way back in the late 1920s. Bruce stayed true to the spirit of the tune by also playing a reso guitar, just like Willie did in his recording. Moving, indeed. I had to investigate. Serious G.A.S.raised its lusty head again! The first resonator guitar was made in 1926. A guy named John Dopyera had been asked by a guitar player (who was constantly being buried under the sound of horns) to make a guitar for him that could compete with louder brass and reed instruments. This was before the days of electric amplification so the only option was to make a louder instrument. He decided he’d make a guitar out of metal, and add to the front a kind of ‘speaker’, or resonator, that could amplify the guitar sound more. They then discovered that you could get close to the same result from building a wooden guitar, but adhering the metal fixtures to the front. It worked! Players were hooked and the new instruments started rolling off the line like hotcakes, at times up to 50 guitars a DAY, which for that time was undeard of. That sing. Without words. And have strings. You get the picture. Not even two years after John formed National guitars and changed the industry, he quit the company. His financial backer patented a single-cone design, that they both had discussed and worked on, without including him. Rude! So, he started another resonator company, with his brothers, in direct competion with his first company – “Dobro“, which was a contraction of “Dopyera Brothers”. Both companies survived the Great Depression, and even thrived. No surprise; music knows no financial boundaries. Eventually, electric amplification made the loudness factor a moot point, but the different, signature sound of the resonator kept it in guitarist arsenals. Both brands are still being sold today, albeit under different leadership.They’re especially desired by Blues and Bluegrass artisans, and it seems like you can hear their distinctive voice on recordings these days more than ever. And speaking of that… the first artist to ever record on a resonator guitar?? Tampa Red, playing a National steel reso. Check him out on Spotify, or HERE ON YOUTUBE. They called him the “Guitar Wizard” back in the day! So… what options do we have today for these throwback-sounding treasures? First, I’ll just throw out here what I play currently: the Regal RD40V. I played through a bunch of resos some years back and took home the one that sounded best to my ears. Interestingly, it was NOT the most expensive one. In fact, I was floored when I realized that a much more expensive Guild guitar (a brand I’m a huge fan of!) just didn’t sound as good as the one I took home. Whodda thunk?! I’m always listening mostly for how things will sound in the studio, since that’s where I spend most of my time. This unit didn’t come with electronics, but I didn’t care since I mic everything up from multiple angles whenever I record any kind of acoustic guitar. The sound is great – metallic bite but still with an undercurrent of warmth due to the mahogany body. It fits nicely within a band mix too. I use it for doubling and panning in tandem with a regular acoustic guitar. Of course, if you’re ready for some slide, tune down and take it away on this one… it’ll get the job done with grit, gain and gumption! Since there’s some confusion about all the monikers these instruments have, let’s take a moment to clarify. 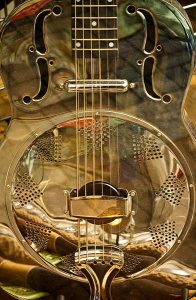 If you hear people talking about a “Dobro guitar” in our day and age, it usually means, simply, any resonator guitar. “Dobro” over time became like the word “Kleenex” – less of a brand name and more of an adjective for a certain type. Though most people today use the two words interchangeably, Gibson, who now owns the Dobro name, is quick to point out the differences in their resonators compared to others (Hint: it’s mainly in what type of metal cones are used). Still, they’re basically all the same instrument, but built with differing types of metal amplification cones. About the only time I wouldn’t use the term “Dobro” is when a reso has THREE metal cones. That was the design of the original National resonator guitar, before the Dobro company even existed. A lap reso will typically have a very high action, so you won’t be fretting any notes on the instrument at all. Instead, you’ll play solely with your steel bar or bottleneck slide. This type of reso is typically played on your LAP, not across your chest in the Spanish style. The square neck lends itself to more stability as it sits on your leg. 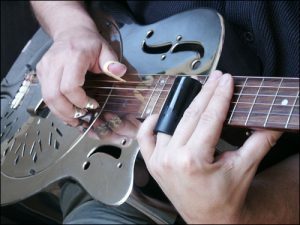 If you go with a conventional curved-neck dobro, you’ll wear it with a normal guitar strap across your chest and be able to fret notes on the lower action, AND use a bottleneck slide. As with any guitar, reso guitars can come ready to be amplified or not. Some sport piezo pickups, some internal mics, some even a combination of both, or… some have nothing. Which you choose obviously depends on the types of crowds and venues you want to pursue. It’s also an option, however, to buy a reso now that has no electronics and simply install them later. If you can’t do this yourself, there’s usually a music store or luthier somewhere near you that can do it for you. I’ve used this method with a couple of guitars. It enabled me to buy the guitar at a cheaper price, get proficient on it, then add the amping later when I had more money and was good enough on the instrument to use it in concerts. There is a real difference between an all-metal Dobro guitar and one that has a wooden body. Different types of songs and music will call for each of these different approaches in construction. I actually prefer the all-metal body for a lot of things, but especially for recording. As soon as you hear an all-metal reso, you instantly know this is NOT your papa’s acoustic! The resos that have a wooden body, on the other hand, are often very subtle in their difference, and thus not as instantly recognizable as something “other”. To see a really good video of the different sound between the two, CLICK HERE. The Tri-Cone Reso: This is the very first kind of reso ever made by Dopyera. If you take the top metal cover or faceplate off of this guitar, you’d see underneath three separate convex cones, each one designed to amplify the sound on its own. Combining the three of them gave the musicians in the late 20s and 30s the bigger volume they needed to compete with those #$%! @ horns! These have a more complex engineering, so they’re typically more expensive. They have great sustain tho’, and a more complex robust sound, distributed more widely because of the number of cones. Slide players are big fans of this type. The Biscuit Bridge Reso: These dobro guitars look different from the tri-cones, so it’s easy to tell them apart. Under a metallic cover plate, there is an inverted cone, looking convex, with a small black piece of wood that’s called the “biscuit”. The saddle that the strings are set on rests in a slot in this black biscuit. This type of reso is used a lot in Delta Blues. It produces strong fundamental frequencies, but not so many overtones. It also has a very quick, strong attack, but not so much sustain. Some say it sounds “dirtier” than the others. spider web, type of look of the whole bridge assembly. There’s a lot more string vibration dispersal with this type, since there’s so many places where the bridge leads to the cone. The spider cones also sit under a metallic cover plate, but its cone appears concave. Then, on top of that cone sits a spider-web-looking structure that supports the saddle and strings. round band of wood. If it’s a quality soundwell, it will be hard wood and have large holes in it to disperse the sound throughout the body cavity of the guitar. To see a video showing you a biscuit type and a tri-cone taken apart, GO HERE! To see the innards of a spider versus a biscuit type reso, CLICK HERE! Kidding, Mike!! 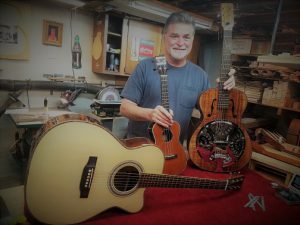 For those of you that haven’t yet been introduced to Mike Franks, by way of my article that expounded on the outstanding craftsmanship he poured into making my #1 acoustic guitar, check out THIS POST! Otherwise, let me just say that you’d be a rare player indeed if you ever met as skilled a luthier and devotee to the guitar-making craft as Mike. His instruments are one-of-a-kind, hand-made, lovingly perfected, and an timeless JOY to play. Roll tape! Er… I mean,… Hard Drive! TEAJ: So, Mike, how did you first start making resonator guitars? MIKE: Well, I was always interested in resos, so when I finally really wanted to build them I went into (a local shop), and I took down and played everything they had hanging there, and, honestly, I thought they all sounded bad. TEAJ: How do your resonator guitars differ from the ones typically sold at music stores? 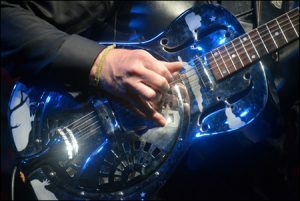 MIKE: Well, there are three things that separate a well-made Dobro-style instrument from the posers. MIKE: Well, I’ll tell ya. First, the raw materials: Most resonators you find out on the market are made out of sub-par wood – many even out of plywood! 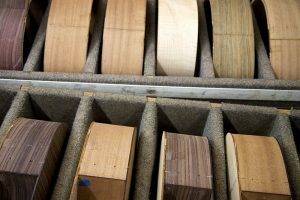 If you want a great guitar, you have to start with great wood, otherwise you might as well stop right there! TEAJ: And the second feature? MIKE: Second is the acoustic contribution of the body: Most music store options have a flat back, and a flat front. Take a look and you’ll see what I mean. That flatness doesn’t lend itself to resonating very well. So they don’t project as well and they have less harmonic content. My guitars have an arched front and back, so you get a lot more sound and many more frequencies pouring through the F holes or sound ports on the face of the guitar. To get a real feel of how LIVE a guitar’s back is, do this: turn the guitar on its side, strum the strings, and feel the wood on the back. If you don’t feel much vibration, then you have a pretty dead back and it’s not gonna contribute significantly to a great-sounding instrument. But if it’s rounded, as my guitars are, it’ll contribute greatly to tone and volume, because of the parabolic effect causes it to resonate more. TEAJ: What about the third thing? MIKE: Finally, if you want a really good resonator guitar, you have to consider the quality of the cone and the spider. If you take a look at most mass-produced resos in the music stores, their cones are merely cheap, STAMPED cones, meaning they stuck a thin piece of inexpensive aluminum into a stamping machine and, in one crush, out pops a sub-standard cone. To really resonate well, across the musical spectrum, the aluminum has to be hard, thin and hand-spun. Like drum cymbals! Just as the best drum cymbals are spun by experts, so the come out sounding all dead or floppy, so too are the best resonator cones only produced by few experts who really know what they’re doing. The only two people that I trust in the world that really know how to produce superlative cones are Quarterman and Beard. Their cones are hand-made, hand-tuned… made with a flexible lip around the edge so the cone can vibrate easier. That’s what you need for a cone to sing. And when it does it will have a clearer sound, longer sustain, and more overtones. TEAJ: What style of resonators do you create? For all the resos I produce, I use the single-cone spider bridge design. This spider type of engineering is always warmer and louder to me from the other designs. The guitars I make aren’t exactly like what the National company, or the Dobro company made, but they’re typical of that approach. I also use solid mahogany for the body, solid ebony for the fretboard; brass for the tuners and other small parts. No cheap, second-rate parts anywhere – just parts and materials that perform great long-term. TEAJ: How many resos that you make are ready for electric amplification? MIKE: Well, that’s an interesting question. I’d say… probably about 50% to 75% are made to plug in. Ya know, most of the people buying my guitars are out there touring and playing a lot, so they typically are going to need amplification ’cause they’re with a band. TEAJ: And what amplification electronics do you use? MIKE: There’s really only one company that I think is worth it: Fishman. If I’ve made a Dobro with a square neck, which is usually played with a steel guitar bar, then I put in their “Jerry Douglas” set-up. If I’ve produced a round neck reso for a customer, based on all their preferences, then I’ll stick their “Nashville” system in. Slap Down Your Dough For A Dobro! Thanks, Mike! Excellent stuff, and you can tell he knows his business. To see some of the finest guitars ever made, go to his website at mjfranksguitars.com. If you’re like me, you’ll need a towel to catch all the G.A.S. drool – fair warning! 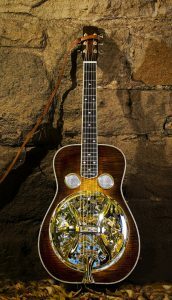 If you want to read more detailed info on resonator guitars, besides all that we’ve covered here today, check out Wikipedia’s POST HERE. It’s got a lot more juicy bits and nitty-gritty beyond the scope of this article. Really though, your best bet is to simply… BUY ONE! You know that you can only truly understand an instrument once you’ve played it. So go pick and grin! If you play it enough, you and your Dobro will enjoy yourselves into quite a reciprocally beneficial relationship… one that just might find you developing your own style. 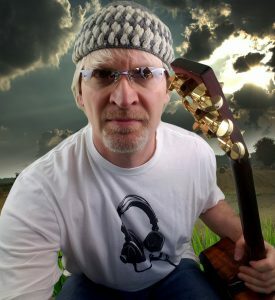 Are you already an experienced resonator player? What styles, tunings or neck do you prefer? What Dobrophonic string explorations have inspired you in the past? Tell us in the comments so we can pass your insights along too! Thanks, Ryan! I always enjoy talking about the gear I’ve managed to snag. I ALSO learn things occasionally as I look back at the rich history of musical instruments and their accompanying machinery. No matter how much you know, you can always learn more, right?! 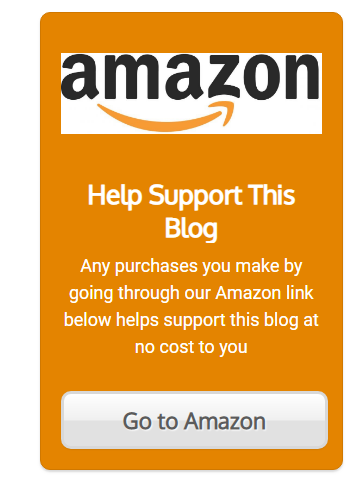 Great job, Teaj, on your website thus far! I am loving that you talked about the different types of resonator guitars and how they really work and sound and the history of their use! I absolutely love the menu at the top too. You should get a custom logo! Keep up the good work.